Assembly is an ideal time to cover safeguarding or e-safety issues with year groups or the whole school, which is why we have developed these assembly plans for introducing students to, or reminding them of, safeguarding and e-safety issues. You can pick and choose an assembly as a "one off", or use them in sequence throughout a term. Each of our secondary assembly plans includes a PowerPoint presentation for the students, and an easy to use script for the teacher. You can of course amend the PowerPoint if you wish to suit your own particular needs. The assemblies are designed to be used by non-specialists, so you don't have to worry about being a safeguarding or e-safety expert prior to using them. Each assembly plan lasts around 10 - 15 minutes, so fits in easily to most school assembly slots. Sexting is when sexually explicit text messages are sent from mobile phones or tablets. These could be text or image based. This assembly clarifies what sexting is, what the risks are, and what the law says about sexting. 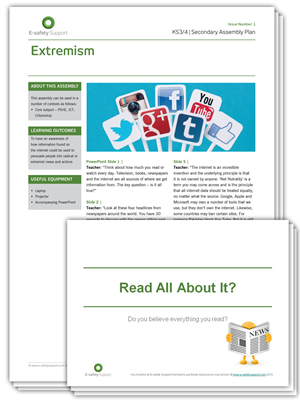 It uses two case studies that have been in the press to illustrate key points and dangers. The assembly includes a teacher script and a PowerPoint for display. 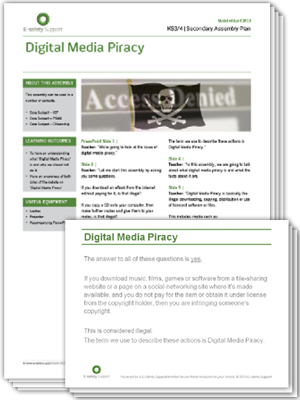 This important and relevant secondary assembly resource allows key stage 3 and 4 teachers to raise their students’ awareness and understanding of the issue of ‘Digital Media Piracy’ and supports the delivery of ICT, PSHE and citizenship. The assembly plan begins by testing the students’ knowledge of the subject by asking them various questions associated with ‘Digital Media Piracy’. This is to raise their awareness that some of the practices they may carry out such as copying music or films for friends may be breaking the law without them realising it. The assembly then turns it’s attention to the argument that pirating digital media is impacting the creation of new music and other media. Various facts are presented for discussion with the students and although both sides to the argument is offered, great care has been taken not to reduce the seriousness of committing digital piracy, which obviously remains illegal. 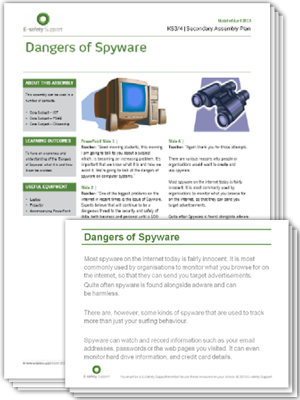 This stimulating secondary assembly resource allows secondary school teachers to use the assembly to highlight the dangers of spyware and raises the students’ awareness and understanding of this important subject. The assembly commences by highlighting that spyware is one of the biggest problems on the Internet and is, and will continue to be, a serious threat to the security of both personal and business data. The students are asked to attempt to define what spyware is and then invited to provide explanations as to why anyone would want to create spyware. The assembly also draws the students attention to the fact that once the information has been gathered it is then free to be passed on with the potential of getting into the wrong hands and leading to fraud or identity theft. Students learn how to protect their computers against infection from spyware by emphasizing that the best approach is to prevent spyware getting onto machines in the first place. The assembly concludes by emphasizing that by preventing spyware infection the students are ensuring that both their data and their computer will be much safer and secure. 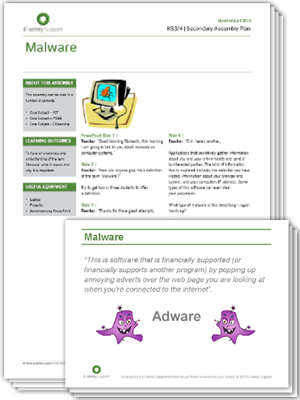 This engaging secondary assembly resource allows secondary school teachers to raise the students’ awareness and understanding of the issue of Malware. The associated presentation starts by asking the students to provide their own definition of what Malware is, followed by an official definition. Students take part in a quiz where definitions of different categories are provided and the students guess what type of malware is being described. After the quiz, the presentation looks at some of the methods that malware writers use to infect peoples’ computers with their malicious code. The assembly then turns to the best ways to stop malware getting into the students’ computers. It informs them that prevention is better than cure and offers various suggestions to prevent infection such. 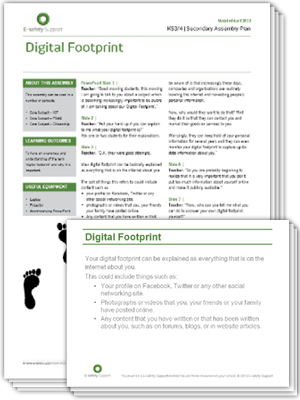 This fascinating secondary assembly resource gives secondary school teachers the opportunity to use the assembly to explain what is meant by the term ‘digital footprint’ and raises the students’ awareness and understanding of why it is important. The assembly commences by giving the students an opportunity to explain what they think is meant by the phrase ‘digital footprint’. The assembly then explains that whenever we subscribe or sign up to a website, we are encouraged to post aspects of our lives online and that worryingly, most of this information is freely available for anyone to view and collect. The presentation then moves onto describe what methods the students can deploy to uncover their own ‘digital footprint’, such as simply searching for their own name on Google and other search engines. The assembly then shift to the reasons why we should take care with what we contribute to our ‘digital footprint’ highlighting issues such as the increasing number of employers who are searching the Internet for the ‘digital footprints’ of potential job applicants. The assembly concludes by describing some of the things students can do to capitalise on their ‘digital footprint’ by showcasing work that demonstrates their skills, experience and knowledge. 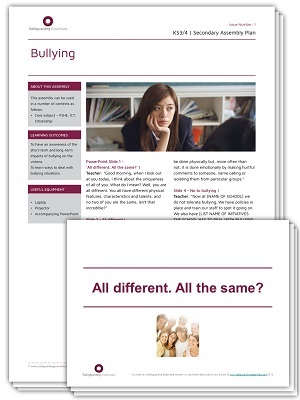 This stimulating secondary assembly resource allows KS3 and KS4 secondary teachers to focus on developing students awareness and understanding of cyber bullying as part of the PSHE/Citizenship curriculum. This assembly plan sets out to provide advice, awareness and explanation about what cyber bullying is and the many forms it can take. The students are then informed about the people that may get involved in cyber bullying such as the person who is retaliating on behalf of a wronged friend, the bully who wants to exert his/her authority, those who just do it for entertainment and the ones who cyber bully just because they can and they want to appear tough online. 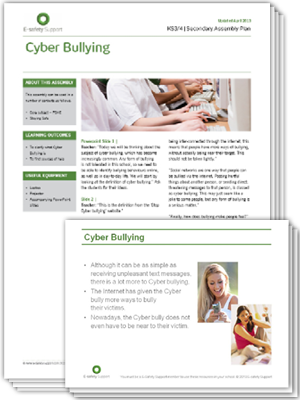 This cyber bullying assembly plan offers secondary school teachers the opportunity to give the students the information, awareness and knowledge to know if someone is trying to cyber bullying them or if a friend is being targeted. Through the assembly, the students will learn how to react to cyber bullying and where to find information on what actions they should take to stop it. This assembly resource engages with the ICT, PSHE and Citizenship curriculum allowing teachers to raise children’s awareness and understanding of ‘Safer Internet Day’. This is the 16th ‘Safer Internet Day’ and occurs on 5th February 2019. The assembly plan addresses the theme of ‘Safer Internet Day’ for 2019: ‘Together for a better internet'. This assembly presentation highlights the positive ways in which the online world can be used. As part of this assembly, children are given examples of how to use the Internet in a constructive way and are encouraged to come up with their own tips. Pupils are given the opportunity to suggest how they might use the Internet in a positive way and how they can get involved in Safer Internet Day 2019. 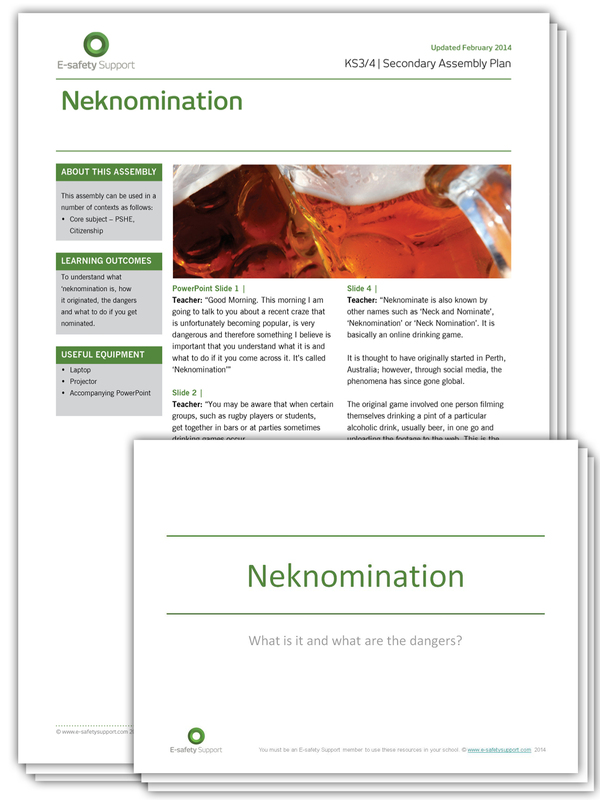 This excellent secondary assembly resource allows secondary teachers to raise their students’ awareness and understanding of the phenomena of internet trends, which became popular due to their proliferation over social networks. 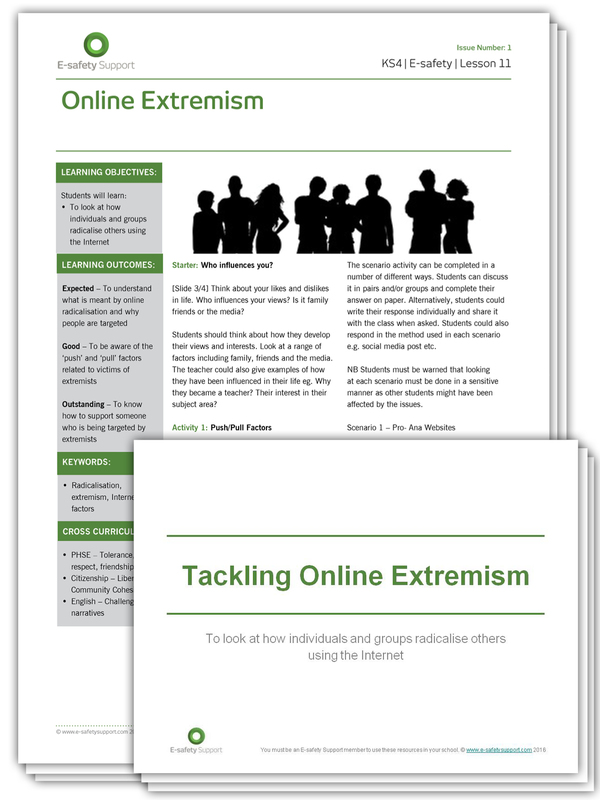 Using the associated presentation, teachers can use the assembly to talk to the students about both the positive outcomes that can be achieved by online trends and also the risks that can become part of certain internet crazes. The presentation also talks about the peer pressure associated with participating in crazes and the potential for bullying. The main focus of this secondary assembly is to encourage pupils to think critically when using the internet and consider that bias and opinion is an intrinsic part of the internet. •	Is everything on the internet true? 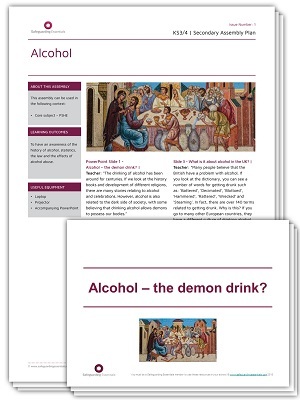 This assembly designed for KS3 and KS4 pupils takes a look at the history of alcohol, some of the statistics surrounding the use of alcohol, the law and the effects of alcohol abuse. The assembly also gives pupils the opportunity to think about why they may drink alcohol and the pressures they may face to drink underage. 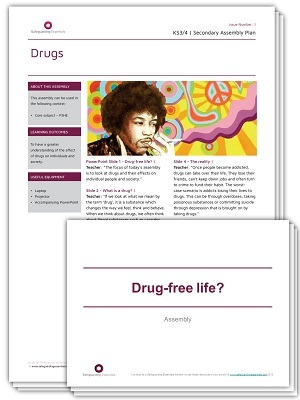 Use this assembly to help students gain a greater understanding of the effects of drugs on individuals and society. Students will be encouraged to think about how drugs are glamorised, and what the reality is. They will also look at how the use of drugs can affect those around us. This assembly will help key stage 3 and 4 pupils build on their understanding of mental health issues. 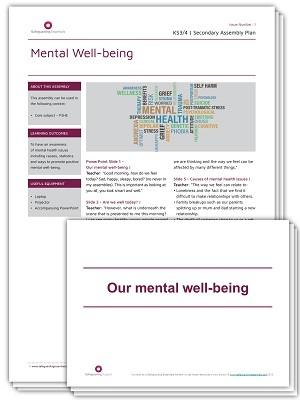 The assembly includes causes, statistics and ways to promote positive mental well-being. In this assembly designed for key stage 3 pupils, students will develop an awareness of the different types of abuse and how to identify if abuse is taking place. 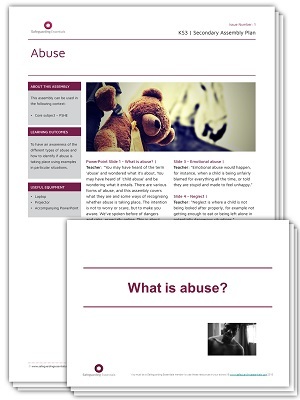 During the assembly, different scenarios are presented to help young people consider the possibility of abuse taking place in particular situations. They are also guided towards support available if they have any concerns. The aim of this assembly is to introduce students to the issue of domestic abuse, as well as giving students strategies for identifying potential relationships suffering from abuse. The theme of this assembly has been chosen given the age of the learners and the likelihood that many of them will be in relationships themselves. 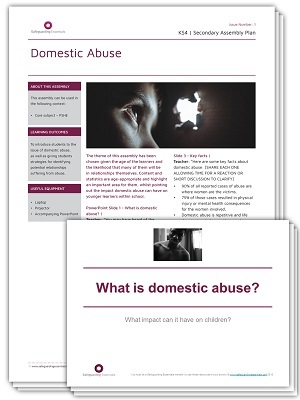 Content and statistics are age-appropriate and highlight an important area for them, whilst pointing out the impact domestic abuse can have on younger learners within school. This assembly can be used in the context of both PSHE or citizenship education. Throughout the assembly, pupils will build an awareness of FGM, what it is, where and why it happens as well as the health effects and knowledge of where to seek help and advice. In this key stage 3 and key stage 4 assembly, pupils will build on their knowledge of bulling and develop an awareness of the short-term and long-term impacts of bullying on the victims. In addition, they will learn ways to deal with bullying situations. In this second assembly on the subject of Sexting (sometimes known as Youth Produced Sexual Imagery) students are encouraged to consider the consequences of sexting, including digital footprint, the law and ‘sexploitation’. Some of our assemblies are replaced over time, however, you may still find the material they contain useful. The assemblies that are contained in this section are no longer updated, but can still be downloaded. Get started with free safeguarding and e-safety guidance and articles in our weekly email updates and special reports. Join as a E-safety Support member for access to Internet safety specific online training modules for staff, governors, pupils and parents, school e-safety policies, lesson plans and teaching resources. Join our full Safeguarding Essentials service for all the fantastic e-safety resources, plus more online training, classroom resources, policies and parent guides covering the wider safeguarding topics. * All prices are shown excluding VAT. This is a subscription product with an automatic annual renewal. Renewal can be cancelled at any time up until midnight on the last day of the current subscription.